Mobile Attendance uses ID cards with QR codes to identify employees. First thing you need to do is to create ID card for each employee. This short video demonstrates how to create ID cards literally withing few seconds. 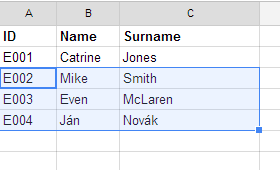 Create new Google spreadsheet and populate it with employee data. For each employee you need to specify unique ID, name and surname. You can take a look on this sample document and use the value defined there. 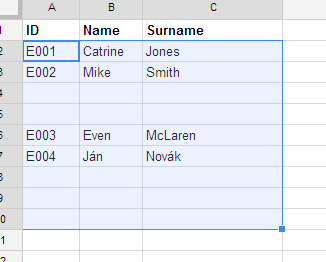 Once you have entered data into the spreadsheet install QR Code Generator add-on which will create ID cards for you. Open the add-on and select ID cards option. 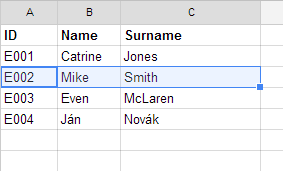 Then select range containing all employees and press GENERATE. The add-on can generates QR codes in one single Google Document which you can print out or you can generate QR codes as PNG files and create more fancy ID cards. You can select a range with empty rows. Empty rows will be skipped.